Go to town in style and not just any style but Steven Land hat style with their latest collection of fancy style fedora hats. The Steven Land collection of fedora hats aren't just your regular fedora style but that have that Steven Land twist to it. 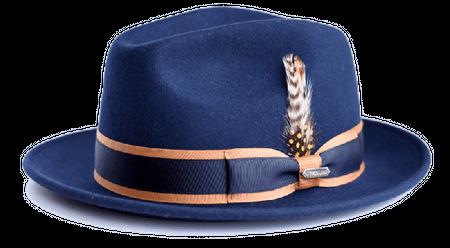 This navy fedora hat has that that classic fedora style with the addition of a navy and beige hat band to let it stand on it's own accord. Made of fine cashmere feel Australian wool felt with of course a full satin lining.